Deer feast on small plants, flowers, shrubs and saplings. The most common deer seen in the U.S. is the white-tail deer (odocoileus virginianus), according to Environmental Education for Kids. Deer repellents are the best way to deter deer from entering property to eat flowers and plants. Deer damage results from their large appetites and from trampling surrounding vegetation and landscaping during their banquet. Remove hair from hair brushes and bathroom sink drains. Ask relatives to donate their hair. Fill one to three mesh bags half-full with human hair. Hang the bags on the perimeter of the property where deer enter. Space bags 3 to 6 feet apart. 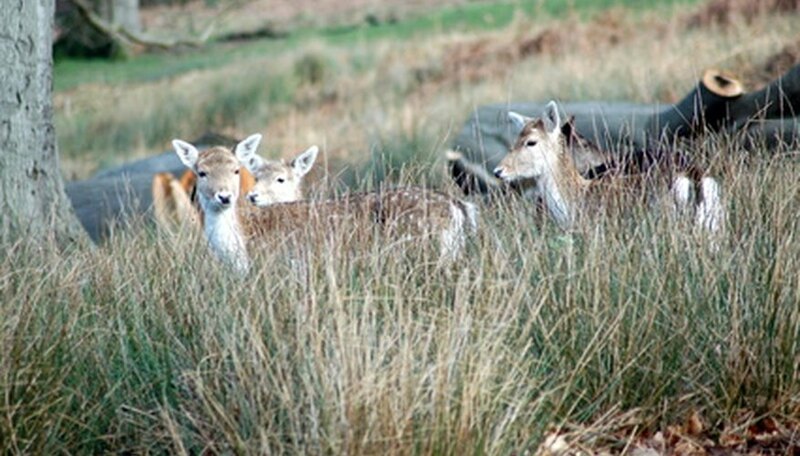 Deer naturally avoid humans. Human odors are a deer repellant, advises the West Virginia Cooperative Extension. Cut a soap bar in half with a serrated knife. Place the soap bar in blender. Coarse chop the soap bar to create soap chips or soap pieces. Pour contents from the blender into a large mixing bowl. Repeat with three additional soap bars. Fill mesh bags half-full with the soap chips. Hang the bags on garden stakes near plants and flowers where deer have been known to eat. Place a 1/4-inch layer of bloodmeal 2 inches wide along the perimeter of the property. Put a layer around the growing areas of flowers and plants. Bloodmeal is a non-chemical deer repellent. Install a single-wire electric fence 30 feet off of the ground around the property perimeter. Use a double-wire electric fence 15 feet and 30 feet off the ground for heavy deer populations, recommends the West Virginia Cooperative Extension. Mark the fence with the appropriate tags and warning signs. Check electric fencing regularly to make certain it is operational. According to the West Virginia Cooperative Extension, deer will return to the property to eat flowers and plants if they discover fences are inoperable. Replace deer repellents after heavy rains. How Much Ground Does a Pallet of Sod Cover?